Where safety is concerned, no price is too high, but what equipment is really needed? What can you wait on and the biggest question of all, how much will it cost? A lot of companies will either supply the equipment you need to get started or take care of it for you. Some places though, may require you to purchase your own equipment, then reimburse you or it will come off as a tax write-off (yeah business expenses). 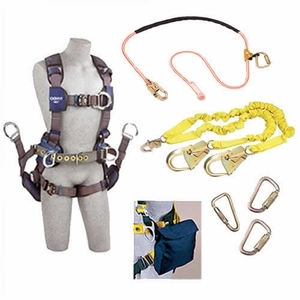 Safety Harness – Arguably the most important piece of equipment for any tower climber, especially a newbie. These come in a wide variety of styles and are made from several different materials, many are equipped with added padding for comfort, different colors for safety (or style) and even built in tool belts. The least expensive one that was found on an internet search starts at $283.00, not including tax or shipping. From there, they average seems to be $300-450.00. One deluxe model runs just above $600 and is made of a lightweight aluminum, with six adjustable straps for an amazing fit. It also has quick lock closures and back support. Helmets – Just because they are for safety, doesn’t mean they can’t be comfortable as well. A few select models are available with a favorite team logo, making them easily identifiable. Unlike a construction workers helmet, the hard hat for a tower climber needs a strap (for obvious reasons). Overall, these run from $100 to $160. Models come in different colors, but the really important differences in these helmets is ventilation and material. When you are working in the heat, head sweat is not only gross, but dangerous if it gets in your eyes. Some of the models had removable built in head lamps, but without these, a headlamp can be secured to almost any model. Carabineers – Do not, I repeat DO NOT use the ones you can buy at the grocery store for a buck or two. The Carabineers needed for climbing are safety rated by weight. It goes without saying that you need to get one rated for your weight PLUS the weight of your tools and equipment. Compared to helmets and harnesses, a carabineer is relatively inexpensive. Most are under $100, just keep in mind that you will want to buy multiple carabineers. The low end of the spectrum is $20 a piece, with a higher end just under the $100 mark. Shape and the ability to lock it into place are big factors when pricing. Gloves – For a tower climber, any old glove will not do. Gloves will get a lot of use and need to be replaced several times per year. The very basic gloves designed for climbing cost less than a single carabineer, but, grip and fit are important. Surfaces may be wet, hot, cold, sticky, slippery who knows what else. If gloves are too big, they could slip off your hands, too tight and your hands will ache by the end of the day. Basic black ones, I found starting at $4-10. A really nice pair was found for $20. With the exception of one sight which had a single pair of gloves for $90, I found few that were above $30-35.00. If you are going to spend $90 for climbing gloves, ask if you can pay that 5 more times throughout the year. Most will settle for a pair with a good fir and a great grip. There are a few more things to factor in such as boots, bags and rope, but these are a bit more discretionary and, with some exceptions, don’t have to meet rigorous safety standards. Just for the equipment listed above be prepared to spend $473 (price factored for four carabineers and a $10 pair of gloves) to $1,200 to get all of your equipment situated. If your budget is more in the $500-700 range, it will require smart shopping on your part. If even the $473 is making your debit card cringe, see if any of your co-workers have something extra they would be willing to let you borrow. To purchase your own Tower Climber Equipment, visit the Equipment Store.